This year gave me an opportunity to study the environmental sustainability initiatives that have made my home city of Berkeley a leader. In typical fashion for Berkeley, the schools are being greened from the ground up, though individual initiatives. As I discovered when I became the head of the Green Team at the First Congregational Church, the city's faith-based institutions are part of that effort. And the private schools are playing their part, including the East Bay School for Boys, which has found a new home at the Congregational Church. Berkeley California has long been known for embracing progressive causes, and it is no surprise that the city has gained international recognition for its significant and innovative commitment to environmental sustainability. The City of Berkeley itself has adopted a comprehensive sustainability plan with a “zero waste” goal and has pledged to reduce its carbon footprint 80% by 2050; the University of California Berkeley is acknowledged as a sustainability leader in higher education; and farmers markets, edible gardens and urban farms abound. In this urban hothouse of ideas and innovation, the Berkeley public schools are playing an important role in making the city greener. During a beautiful, early fall week in September, I had an opportunity to visit some of the Chicago's greenest public schools: Peterson Elementary School, Vaughn Occupational High School, Waters Arts Magnet School, and Curie Metropolitan High School. This was also an occasion for me to return to my alma mater, Hinsdale Central High School. And I also had a chance to visit with three independent schools that are going green: The Latin School, The University of Chicago Lab Schools, and Morgan Park Academy. I was proud of the collective sustainability initiatives underway in my native land. At the NAIS Annual Conference in February 2013, I will host a panel presentation to recognize the eleven member schools who were named by the U.S. Department of Education as Green Ribbon Schools. Here are profiles of three of those schools: Catlin Gabel, OR; The College School, MO; and Springside Chestnut Hill Academy, PA. When I learned the news that Catlin Gabel School had been selected as one of the first recipients of the new national Green Ribbon School award this spring, I was delighted, and proud. 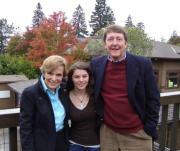 Since I lived in Portland and worked at Reed College in the 1970s, I have known Catlin Gabel to be one of our country’s finest, progressive K-12 independent schools. Our family’s ties to the school are strong, too--my wife Helen, her mother, and a number of cousins, nephews, and extended family members are alums—so I was especially pleased to see Catlin Gabel recognized for its pioneering commitment to environmental sustainability. How did it develop that tradition? In preparation for the publication of Greening America's Schools 2.0 in Winter 2013, I continued the search for best practices across the country. Here are profiles of five leading schools: 1. Waynflete School, ME; 2. Wilmington Friends School, DE; 3. Shipley School, PA; 4. Palmer Trinity School, FL; 5. Montgomery Bell Academy; TN. Founded over a century ago in a residential section of Portland, Maine, Waynflete School has grown to become a thriving, progressive Pre-K through 12 independent school for 560 students that has embraced environmental sustainability as part of its larger mission. It has been my good fortune to know the school first-hand through the work of my friends, School Head Mark Segar and former Lower School Director Cinda Joyce. Together they teamed up with the Waynflete community to make respect and responsibility for the environment a central element of the school’s culture. In my continuing journey to document success stories for Greening America’s Schools 2.0, here are four schools that represent the may varieties of schools seeking to become more sustainable: Overlake School, WA; Savannah Country Day School, CA; Montessori de Terra Linda, CA; and New Highland Academy, CA. In April 2012 The Overlake School, an independent school with 530 students in grades 5-12 in Redmond, Washington near Seattle, was named one of the country’s first Green Ribbon Schools by the U.S. Department of Education, just one of 78 nationwide and one of eleven NAIS member schools. How does one become recognized as a high-performance, environmentally sustainable school? In the case of Overlake, inspired leadership, consistent hard work, and a systems focus on green facilities, operations and curriculum explain how the school rose to the top of the list. 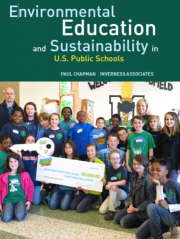 In February 2012 NAIS published my book, Greening America’s Schools, which featured fifty case studies of schools at various stages of becoming more environmentally sustainable. Encouraged by the response to the book, and my belief that telling the story of private and public schools across the country that are “growing greener” will add momentum to this important movement, I have continued the journey. Here are four “virtual visits” I conducted with NAIS schools this year: Idyllwild Arts Academy, CA; North Country School, NY; Rabun Gap-Nacoochee School, GA; and St. Gregory College Prep, AZ. And more are on the way. In two recent talks at the NAIS Green Town Hall in February and at the California Independent Schools Business Officers Association meeting in May, I made the case that greening schools makes sense/cents. It is increasingly clear that environmentally sustainable, high efficiency, high performance green schools offer a compelling “triple bottom line” that promises to save money, strengthen achievement, and improve health. Many of NAIS member schools and public schools across the country are demonstrating tangible results from the green efforts. This article tells some of their stories of success saving significant dollars and highlights these schools: Punahou School; Hawaii Preparatory Academy; Athenian School; Castilleja School; Cate School; Midland School; St. Gregory College Prep; Berkshire School; North Country School; Hotchkiss School; Riverdale School; Lawrenceville School. See the PowerPoint on Triple Bottom Line on the Experience section of the website. How Green is Boulder’s Valley? What does it look like when an entire school district turns green? To find out, I visited the Boulder, Colorado schools on a crisp winter day in February 2012 and discovered a district in the process of a remarkable transformation of its entire system of education and operations, in collaboration with the city and many non-profit partners. From my meetings with everyone, from the Superintendent, Board members and the district Sustainability Coordinator to the students, teachers and staff in the schools, it was vividly clear that Boulder is a shining example of how schools can embrace the highest standards of environmental sustainability. U.S. Secretary of Education Arne Duncan yesterday announced the selection of 11 NAIS schools, among a group of 78 nation wide, to receive the first Green Ribbon Schools Award, a very impressive showing. I delighted to announce that my new book, Greening America’s Schools: The Environmental Sustainability Movement in K-12 Education, has been published by NAIS. Since concluding my career as a school head, I have devoted my energies to “growing greener schools” to help address the significant environmental challenges we face, and I many will have interest in the work. The book describes environmental sustainability in our schools through profiles of 50 private and public schools across the country that have gone green. It shows how schools can partner with colleges, universities, science museums, and outdoor education programs to enhance their environmental education programs. And students describe the profound, positive impact green schools can have on their education and their development as global citizen leaders.